Harris Heat Misc Info | Harris Baseball Softball, Inc.
North Parking Lot - This would be a good area to park if you are playing on a 12U Team. Your team will be playing on Field's 1&3. Babe Ruth Parking - This will be an overflow lot. VIP - This will be an area our Tournament Director, paid-crew, and concession workers will be able to park. South Parking Lot - This would be a good area to park if you are playing on a 8U Team. You team will be playing on Field'd 5&6. 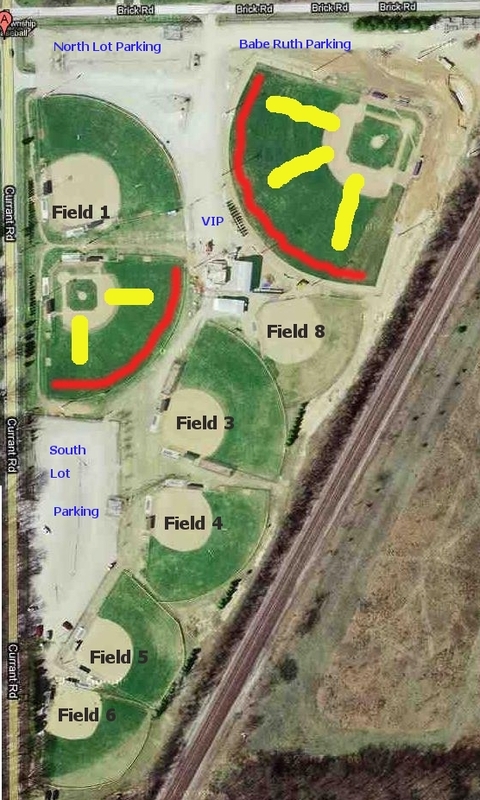 RED Area - If you want to have a designated "team area" to place a tent, put your team bags between games or a place to get together away from the games, go to the RED Area on the map. These are placed on the Warning Track area on both Field #2 and Field #7 (Baseball Fields). Please leave enough room for another team to also work with. We all must share. YELLOW Area - This is a designated "Warmup" areas. If you want to warm up your team before/after a game, please use one of the YELLOW Area's on the map. Much like the RED Area - we must all share.